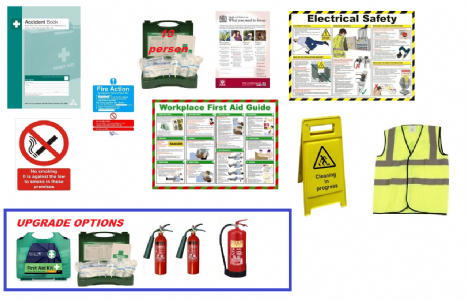 We've put together some of our BEST SELLING health and safety products into a convenient and cost effective pack that covers you for First Aid, Signs, Posters, Log Books and much more. Our Construction Starter Kit 2 contains a wider range of essentials for starting a small to medium size job in the Construction Industry. A FULLY COMPREHENSIVE RANGE of Health and Safety essentials for Medium to Large scale jobs in the Construction Industry. Includes 5x Hi-Vis Vests, 5x Safety Helmets, 1x Large B.S. 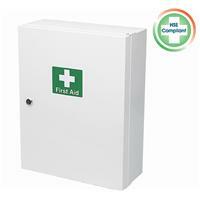 First Aid Kit, a variety of Health and Safety Signs, Posters and more! If you're setting up an Office or Retail environment then our Retail / Office Starter Kit is designed to help you ensure you are fully compliant in regards to Health and Safety practices, all for a great Low price! HUGE SAVINGS on Fully Stocked and Comprehensive Health and Safety Starter Kits. Get yourself incredible discounts on Health and Safety items when you buy as part of a Full Health and Safety Starter Kit!